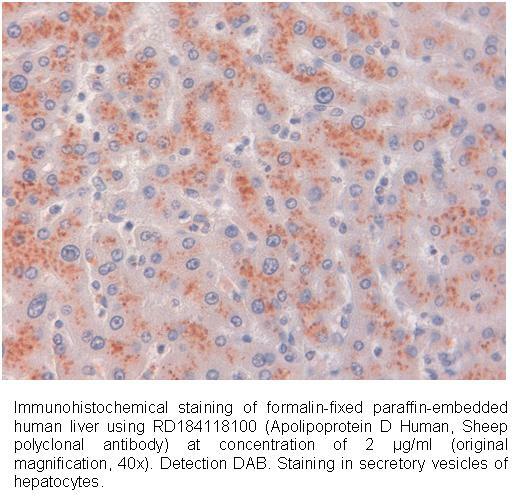 The antibody was raised in sheep by immunization with the recombinant Human Apolipoprotein D.
The immunization antigen (19.82 kDa – calculated) is a protein containing 174 AA of recombinant Human Apolipoprotein D. C-terminal His-tag, 7 extra AA (highlighted). The amino acid sequence of this product corresponds to the UniProtKB/Swiss-Prot entry P05090 (Human ApoD). Following modifications were made: Four amino acid exchanges were introduced at the surface of ApoD (Trp99His, Cys116Ser, Ile118Ser, Leu120Ser) to enhance the solubility of the recombinant protein and another three (Leu23Pro, Pro133Val, Asn134Ala) to facilitate its genetic manipulation (highlighted). Immunoaffinity chromatography on a column with immobilized recombinant Human Apolipoprotein D.
Human ApoD is a glycoprotein of 169 amino acids, which was discovered in plasma as an atypical lipoprotein. There, ApoD is peripherally associated with HDL via disulfide bond with ApoA-II , which itself forms an amphipathic a-helical belt that wraps around the lipid disc . 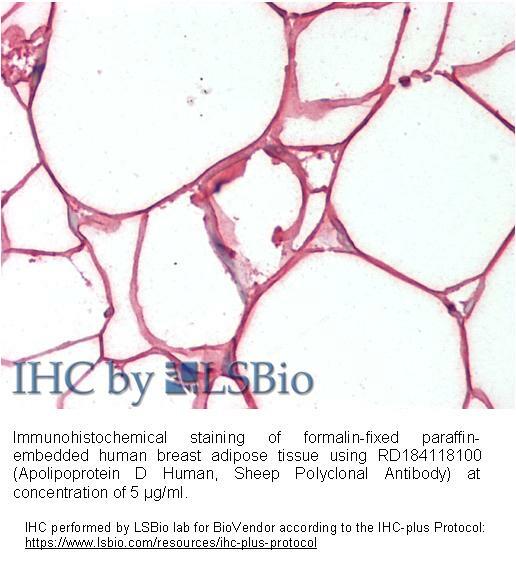 ApoD was also isolated as a progesteronebinding protein abundant in mammary gross cystic disease fluid and it was found as a monomeric protein in apocrine secretion, where it seems to bind odorants. ApoD mRNA is expressed in a variety of organs as well as in certain human cancers. Indeed, ApoD has received attention as prognostic marker for various, often steroid-responsive tumors, including prostate cancer , breast carcinoma, and cutaneous malignant melanoma. In addition, ApoD is synthesized by astrocytes in the central nervous systém and there it seems to be involved in arachidonic acid transport, metabolism, and signaling. Notably, ApoD plays a well documented pathophysiological role in several psychiatric disorders , especially in schizophrenia.